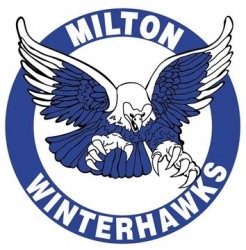 Hawthorne Village Dental Care is a proud sponsor of the Milton Winterhawks AE Minor Bantam Blue hockey team. Milton, Canada, February 06, 2018 --(PR.com)-- Hawthorne Village Dental Care sponsors the Milton Winterhawks AE Minor Bantam Blue hockey team with athletic mouthguards for each player during the 2017-18 season. Thanks to the professional fit that a custom mouthguard has to offer, the Bantam Blues now have access to the highest level of protection from orofacial injuries like busted lips, knocked out teeth, and even concussions; all of which are extremely common in contact sports such as ice hockey. Hawthorne Village Dental Care worked with each player to have an impression made of their teeth, so that a customized mouthguard could be created by hand. As a result, their mouthguard will fit more securely than a conventional stock guard sold over the counter. If - or rather, when - the players take a hit during their game, there is less of a chance of their guard falling out and failing to protect their mouths. Most organized sports leagues now require athletic mouthguards as a mandatory piece of protective equipment for players (especially in contact sports like hockey or football.) For others, it’s up to the player or their parent to decide if they want to wear one. Because so many sports injuries involve the face and mouth, there’s an extremely elevated risk of permanent damage to a person’s teeth. A protective athletic mouthguard significantly lowers that risk as well as the severity of the injury when it takes place. Professional, customized mouthguards can be made to fit all ages and personalized to match preferred team colors. Call Hawthorne Village Dental Care at 905-864-3368 to request an appointment. About Hawthorne Village Dental Care: Hawthorne Village Dental Care is a progressive, modern family dental practice that offers advanced therapies and routine preventive services ranging from dental implants to same day emergency care. They offer extended evening and weekend hours, serving families throughout the Milton, Oakville, Mississauga, Georgetown, and surrounding areas.